I can’t quite recall the last time I ate pizza. Not because, the cravings don’t come calling but having one too many disappointing pizzas simply kills my appetite! But you know when it’s #pizzafest16, we eat pizza for lunch right? My experience from pizza fest last year taught me not to wait until the last day to enjoy the festival. Most of the restaurants are usually packed and the toppings aren’t generous. I had some delicious seafood based pizza for the first time at Mediterraneo last year, you can read all about it here. I like my pizza hot, very cheesy, thin crust and a whole lotsa toppings. For day 1 of Pizza festival, my colleagues and I made our way to Pizza Mojo at the Oval…..they are at big square. 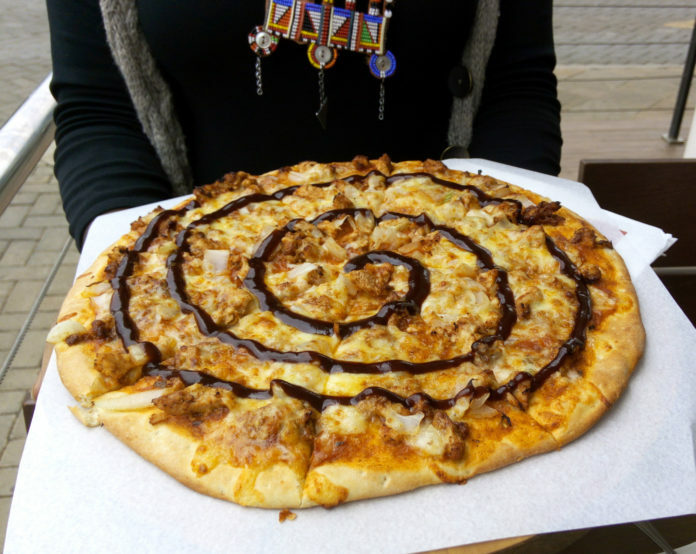 We ordered the meat lovers ‘loaded’ with cheese, beef, BBQ rib, bacon, borewores and pizza sauce. For the second free pizza we ordered the BBQ chicken topped with cheese, BBQ chicken, onion and pizza sauce. Surprisingly, the BBQ was better than the meat lovers, the flavors in the pizza sauce matched better with the chicken and it wasn’t dry. They even got it right with the crust, crispy. The service was great. My friends enjoyed a carlsberg for Sh280 while I had a very delicious double Mocha for Sh250. This is where I say, we broke the treats on a budget commandment. “Thou shalt never make your way to a restaurant without checking their prices.” Sh1950 for a large pizza was more than we had budgeted. If you are wondering yes, their pizza prices are a bit on the higher side, ranging from Sh800 for regular to Sh1950 for large. When you choose any 2 pizzas at Pizza Mojo, you pay for the more expensive of the two. Which places are you planning on visiting during #PizzaFest16, check out the participating restaurants here.